Nadav and Avihu, two boys who some would argue, should not have played with fire. As Aaron’s son’s (Aaron, Moses’ brother and High Priest), they should have known better. They should have known that they were not to make the offerings they did without permission. But they did. Hence, why some commentators suggest they were killed. However, another way to read Nadav and Avihu’s death is that through their passion about making an offering to God they stood too close to the fire. As God accepted their offering they too were consumed by the fire God sent for their offering. 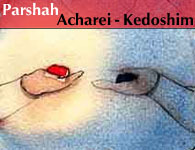 This week’s parashah, Acharei Mot-Kedoshim, begins with the offerings Aaron must make in expiation for his family. These offerings are meant create a strict structure of worship for the priestly clan as they served God and the people. The detail of each of the offerings is carefully laid out in order to ensure there is no confusion as to what is expected of the Cohanim. There are two thoughts toward achieving holiness: First, from Leviticus 10, where Nadav and Avihu were killed because of their offering, to later, these passages in Leviticus 16 setting a very clear structure and order for sacrificial offerings. Nadav and Avihu were overjoyed in their desire to make offerings to God. But is that passion considered to be dangerous? For the Priestly writers, those who took the job description of the Priests very seriously, yes. Nadav and Avihu were giving permission to others that if their sacrifices offered with such passion, were accepted, others would be free to do the same. The Priests were very concerned with anyone who went outside the religious practice box. Hence, why the commentators will suggest that they were killed because they were not following the rules. On the other hand, is it wrong to be passionate about prayer? Of course not. Prayer is a way of expressing gratitude and seeking guidance and strength from and with God. For some, being able to quietly reflect and focus on each word of prayer is a passionate way of speaking to God. For others, it is through singing out with full voice and body that brings the relationship with God ever closer. These words in Leviticus are most challenging because we struggle to find meaning in a practice that is no longer relevant in our lives. We are challenged to take these words and find how we are able to bring them into our world. Where do you fall on this continuum of prayer? Where does prayer speak to you and how are you able to express it? We no longer live in Temple times when offerings to God were left to the Priests. Rather, it is each of us who have the responsibility to offer our prayers to God. How do you accept this responsibility?